Searcher intent is the key to attracting the right kind of traffic. Keyword research can tell you which words or phrases have the most search volume but remember that conversions matter more than traffic. In other words, focusing on keywords with commercial intent will send more targeted traffic to your website resulting in greater conversions although your site might have fewer visitors. “Buy now”, “order online” and “subscribe to” are examples of such commercial intent keywords. You can incentivise such potential customers by using additional keywords like “free shipping”, and “discount coupons”. That being said, do not ignore informational keywords like how to, ways to, top five tips, reviews etc altogether since this category of keywords single-handedly accounts for the maximum proportion of searches which automatically makes it valuable for SEO. 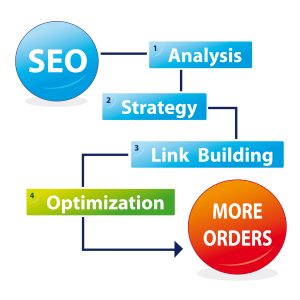 In-bound links have always played a seminal role in search rankings. Google recently confirmed that it is one of its three most important ranking factors. However, Google’s search algorithm discriminates between quality links from trustworthy well-ranked sites and links from questionable websites. The better your site’s link authority is, the higher would be its ranking. Therefore, you need to focus on getting back-links for high-authority domains. You can use Moz’s Open Site Explorer to research your backlinks and find new link-building opportunities. Ahrefs Domain Rating Tool is also a great way to measure your site’s link-authority. Additionally, you need to make sure that your backlinks come from sites that fall under the same niche as your business since RankBrain - Google’s algorithm learning artificial intelligence system introduced in 2015 - compares your link-profile with your competitors in the same vertical. Unfortunately, link-building is one the hardest things to do despite its obvious value. Start by creating high-quality informative content that people will want to read and share. Create a blog and link back to your site. Apart from creating your own blog, you should reach out to other industry relevant websites, brands, and blogs. This relationship building exercise is very valuable since a single link from a popular website can send a substantial volume of traffic to your site. Guest blogging, forum posting and commenting are other examples of widely used link-building strategies. Even the most well thought out SEO strategy cannot yield results if you do not have quality content. No matter how many visitors end up on your website, your conversion rate will be poor if your content is not up to the mark. This is especially important in 2017 since RankBrain is constantly getting better at figuring out the context and meaning of web content. Essentially, Google is gradually moving toward intent-driven search results and this is a far cry from its earlier system of matching users with pages containing the identical set of words as their search queries. Moreover, RankBrain will actually penalize you for sub-par content even if your site has a lot of backlinks. Focus on creating unique, engaging, and well-written content that reads easily and naturally. Build your content around a single keyword but feel free to use a couple of related long-tail keywords for context as long as the flow is unaffected. However, be careful to not stuff your site with keywords as Google will penalise you for this. As a general rule, create informative content and use keywords only when appropriate. User experience is an essential part of SEO that begins even before a user actually visits your site. It all starts with search listings on the results page. Use attention-grabbing title tags - the clickable part in the search result - that matches the search query whilst providing additional relevant information. Most importantly, keep it short, about 60 characters or so. The next important signal you see is the URL that comes after the title tag. The URL should indicate to the user that your site is relevant to his/her search query. The third element is the meta-description which comes after the URL. Here you have about 160 characters to expand on your title tag and persuade users to visit your site. On-site optimization on the other hand is a lot more complicated but here are the basics. Keep your website snappy for both desktop and mobile users by compressing heavy images and eliminating poorly performing scripts. Slow loading speeds have a strong correlation with poor search rankings. This is particularly relevant for mobile since Google official integrated AMP, an open source project that helps web publishers create mobile-friendly content to minimize load times across all devices, into its mobile search results in February 2016. Speed is just one of the many elements of user experience. Recently, Google has started punishing sites that use annoying pop-ups and overlays. Finally, it is worth mentioning that user experience should focus on users only and SEO is just a welcome by-product. Design your website so that it is easy to navigate, format and structure your content with visual elements to improve its readability and include a prominent call-to-action button.